Okay, it's Tuesday already and I'm only just posting Sundays games. I was going to post some games for Saturday as well, but it's taken me over four hours to write up and sort out images and videos. This is a little late coming. I've been so preoccupied with other things over the last few days, plus I've been playing Red Faction Guerilla since it was unlocked on the 18th September, which is a fabulous game, though not as good as Fallout 3 (IMO). It reminds me a little of Mercenaries 2: World in Flames which was released last year. It has the same open world areas, some of which are locked off until you've completed several mssions, youre fighting a oppressive regime, it has vehicles that you can drive around in, plus it has destructible environments. The main difference though, is that the latest Red Faction has been designed around a new game engine that enables massive destruction of buildings which when being destroyed emulates real physics, whereas Mercenaries 2's destructible buildings only blew apart in a certain way. 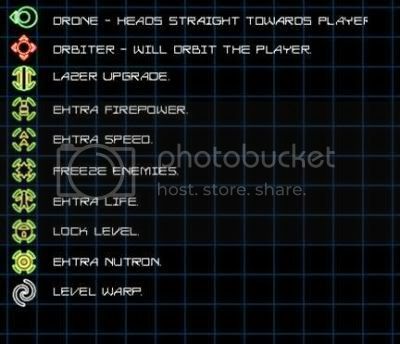 The following three games are all space shooters. One of which was a commercial title until 2007 when the author decided to give it away. When you’ve been gaming for over 20 years and seen many consoles and their games come and go you do start to think you have seen everything. Thankfully though there are the occasional glimpses of quirky brilliance that seem to appear out of nowhere, like Beautiful Katamari and Little Big Planet. I never thought I would see such a thing from a free to download retro shooter, but I have to say it definitely took me by surprise. Whether it’s for the right reasons or not is uncertain, but rest assured that after having a blast at (deep breath) Atlas UFO Robot Goldrake Spacer I just can’t make out what to think. The game is from a bunch of Italian coders under the Crian Freesoft X moniker and is firmly embedded in the old 70’s anime style. As soon as you see the main menu you know its not going to be like your standard (some would say comfortable) retro blaster with the normal looking spacecraft, alien style creatures and an action soundtrack. If this is the rulebook then this game didn’t bother to read it and the result is mad, but strangely fun. I have to admit that I was one of those Akira geeks and did have a soft spot for the art of Japanese animation, so that’s perhaps the reason for my raising smiles on booting this up. The title screen is so cheesy it cannot help to make the ends of your mouth start to curl towards the sky. Even from this early start you know this is firmly tongue-in-cheek with its style. The ship you control is a Voltron/Vectorman style hybrid that seems to have been stuck in mid transformation and Super Mega Ultra Stange nameosaur (like I know what it’s called…) from the Mighty Morphin Power Rangers was out on his rounds when he phoned to get some help. You can tell they’ve pulled a fast one with the music and lifted all of the tunes straight from the anime series of the past. This is almost a master stroke because it really does give it a crazy charm which is genuinely grin inducing. The voices and sound effects are also in the “nabbed from cartoon” category, although unlike the melodies the vocals may start to grate after the 10th listen, although this game does have one of the BEST high score tunes in video game history. If you disagree with me I would love to hear from you (sounds like a good idea for an article that – Ed.). The graphics really aren’t anything to write home about. The main ship is ok, but the rest of the game looks like something that wouldn’t look out of place flying through the skies of an old live action Godzilla movie. The thing is though, instead of this making you want to switch it off, like most iffy visuals can do, especially if there is money involved, you just want to keep playing it. The bosses are actually quite cool. A strange mix of standard ship and film monsters from the land of the rising sun. The second boss is a perfect example. You may think you’re going to be battling a standard craft, but then it opens up like a clam to have a dragon curled up inside it. It truly is a title overloaded on the strange. It is this madness and rather immature feel to Goldrake Spacer that seems to make you want to play it. It’s almost as if your restraint and will power are just neutralized, as it really makes you remember that gaming is entertaining and that enjoyment can be found in the strangest of places. That is most definitely the case here. It may not play brilliantly and it also has a feel of something made in the spirit of Public Domain gaming, but I think that is where it’s true beauty lies. It’s a title that, as a seeker of high quality titles and modern, up to date sheen and polish, you just shouldn’t give time to and dismiss like it was a candy wrapper. You just TRY and do that though, as it just draws you in with it’s innocence and cheeky immaturity and you probably won’t be able to. I’m not saying the game itself is a fantastic take on the old school shoot-’em-up genre, but it’s not trying to be that. It’s just something to download for a bit of fun and that is exactly what it does. I think it takes something as left-field (see? I’m so talented I can use baseball terms) as a game like Goldrake to make you remember what gaming is all about. It can become too easy a thing to get sucked in with all the business like corporate relentlessness and masses of hype and publicity for the next big thing that you can begin to lose the whole point to playing these shiny bits of software in the first place. Remember what FUN is? Fun is that one core ingredient that is required to get full enjoyment from not just gaming, but anything in life. We are so blinded by this fact because of the big names in this industry that it sometimes takes a quirky little title like this to help you regain the proper mindset for playing everything else. You can end up playing Zombies on Call of Duty: World at War and begin to wonder whether it’s you or them that are plodding along on the same old course. If you can find the time to break away from the monotony of the modern day gaming circle, you should download this simply to show a glaringly obvious fact. There is more to life than specs, bugs and mock’n'drole. As a game, Goldrakeis simply average, but as a lesson in enjoying the industry we are enveloped in, it’s a very valuable thing indeed. I can remember when this was shareware. The author made it freeware in 2007 because he will be releasing a newer version with updated graphics, though I’m not sure whether the project has been abandoned as that was announced over two years ago. It all began with Asteroids; navigating a small spaceship through space, avoiding and destroying asteroids that passed by. It was a game of passion where a lot of youths spent an awful lot of money pumping in the dimes and pence to gratify their link to such things as the Apollo and Space Shuttle programs of NASA. I remember being entranced by the space orientated games; and I owe it to the interest I’d had in the early space exploration carried out by NASA. (We weren’t privy to Russian developments in the then space race, so only concentrated on the U.S. side of things and then the European Space Agency. Anyway, using a minimalistic design, Asteroids seemed to create maximum pleasure for the gamer (whatever his/her motives were for playing). 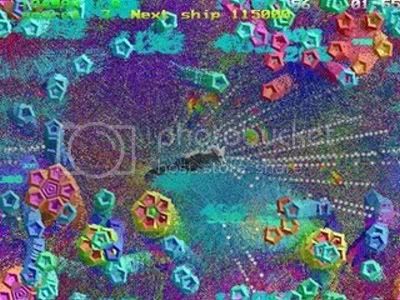 Sphere’s of Chaos is a very good clone of Geometry Wars. 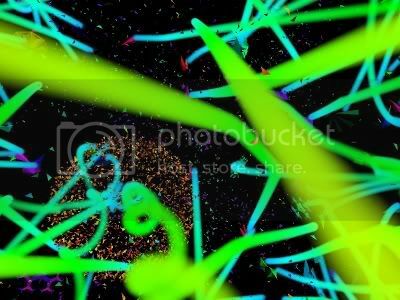 Geometry Wars, a highly successful game for the Xbox 360 and later ported over to the PC (I bought it via Steam recently). .
Spheres of Chaos has visually unusual special effects using thousands of pixels (now up to 256,000) to create firework explosions, rockets and trails. And it's quite noisy too. Spheres of Chaos is quite simple to play. 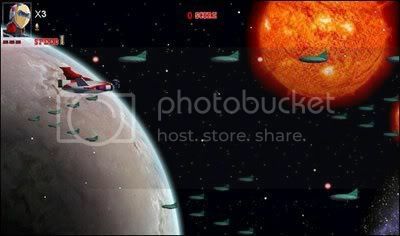 The small grey arrow in the centre of the screen is your ship, floating in space. You rotate it by moving the mouse left and right, and the right mouse button fires it's engine, longer presses make it go faster. The ship drifts in whichever direction it is going, and gradually slows down by friction. To stop it faster, turn around and use the engine again. Or press left-alt or middle mouse button, which increases the friction (quite useful against black holes). There are other things floating about in space with you. Just some harmless grey spheres at first, but it doesn't stay that way for long. 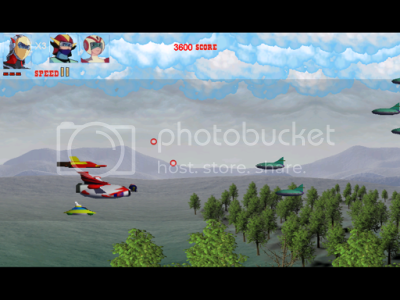 Press the left mouse button to shoot them, and make some nice explosions. The aliens all behave differently. Some chase you, some chase each other, and some do their own thing. Some have more friction and stick to black holes, some just drift. Most split into several parts when shot. 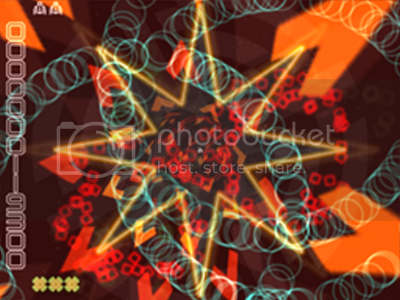 Sometimes when you shoot something, a spinning triangle will appear. If you run into it, your ship will get an extra ability for a short time. Three way shots, shields, or a smart bomb, that sort of thing. The triangles slowly change color, and the color determines the ability it gives. If you shoot them they also change color, and go bongggg. Sometimes when you have cleared a level, a large boss alien appears. These take a lot of shots to destroy, and have more complicated behavior. When you destroy them they create several triangles. The demo has one at the end, and the full version several more types. At random intervals, one or several 'black holes' will appear. These have gravity that attracts or repels the other aliens and shots. The gravity is stronger closer to them, and you can 'orbit' them if you are careful. The also spray color particles around and look quite pretty. 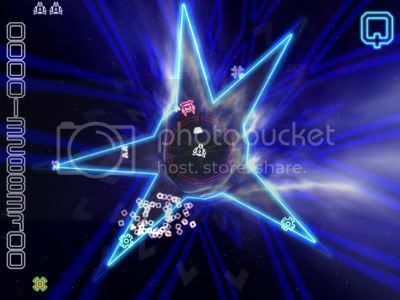 If you are slow in clearing a level, small unfriendly ships start to appear. First one at a time, then in swarms, a bit like wasps. Occasionally other strange objects will appear. 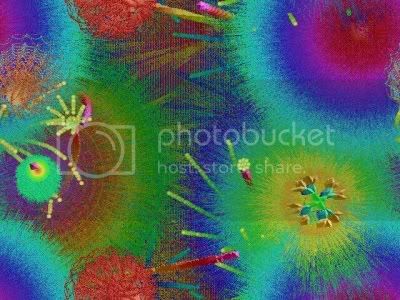 Fields of flowers, things that are supposed to be a bit like bacteria, noisy bomb dropping things, spinning shooty things. As the game progresses it gradually gets faster, there are more things on screen, new aliens appear, and it generally gets more manic. Scoring points earns extra ships, every 10,000 points at first, but less often the further you go (otherwise it just becomes very easy because of the amount of score-able stuff). The registered version allows multiple players, with a variety of game variations. 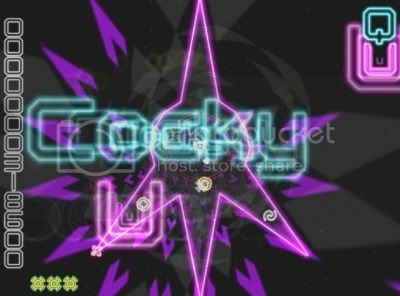 •	Fly your ship around the screen, shoot things, and try not to crash into them. •	To aim your ship, move the mouse left and right. •	To fire, press the left mouse button. •	To move, press the right mouse button. •	To stop again, press the 'brakes' key (left alt), or turn around and use the right mouse button again. •	To do an emergency hyperspace jump, press the left ctrl key, or move the mouse up suddenly. •	If your mouse has a middle button, this may be 'brakes', but it may also change the ship turn speed as a side effect. •	Shoot things to score points. Every 10,000 points you get an extra ship. At a score of 100,000 points this changes to every 15,000. And at 500,000 it changes to every 20,000. •	Bump into the triangles to collect them. 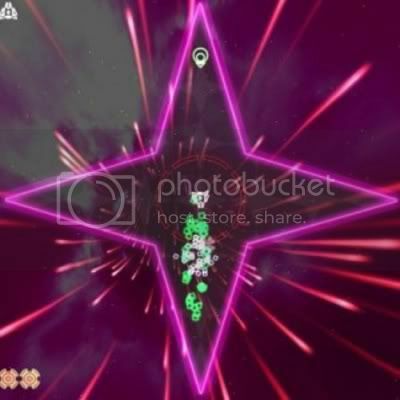 Your ship will temporarily get extra powers, depending on the colour of the triangle. All the different types of extra power last the same time. If you collect one you already have it adds to the time left. •	Some types of extra powers come in pairs, such as bounce and zap shield. If you collect one type whilst you already have the other of the pair, you get the new type, with the time remaining for the old one added on. •	Some types will combine together, such as fast shots and spread fire, giving fast spread fire. 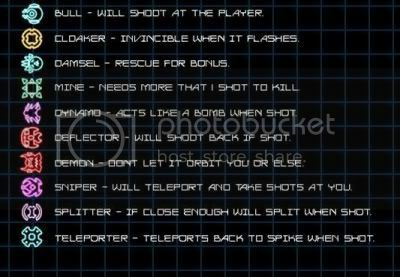 My favorite is score multiplier followed by smartbomb. •	Shooting a triangle changes its color randomly up or down two colors. •	Shooting and destroying a triangle up 'collects' it, but it will only last half as long. F2: Single step when paused. F3: Toggles scroll view on and off. F4: Toggles a display of 50ths-of-a-second's pre game loop and current sparks. F7: Change background type up 1. F8: Change background colour up 1. Space: Start game from main menu. F12: Hide scores during game, for taking screenshots. ([i]A joystick can be used as an alternative). 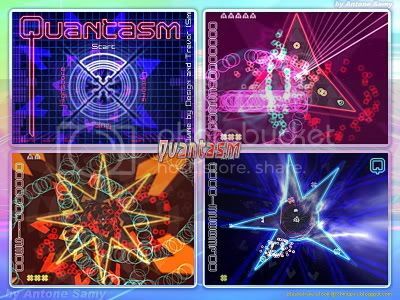 There’s an updated version of Quantasm. I’m not sure which you get via the download link. So to ensure you get the updated version which has improved ship control ( players originally complained that the ships responses were too slow, which made it hard to survive against the onslaught of enemy ships, so the developer did something about it). You can get a patch (~1Mb) to update the game from the same page as the online scores below. There’s a hyperlink just below the large yellow button that says Home. 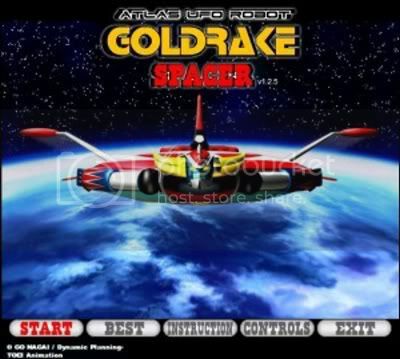 Thanks for 2 new games(Goldrake Spacer & Quantasm) WR!!! sorry, I should have given you a mention above as it was you who brought the game to my attention. :) Yes it is a great game. I do love psychedelic shooters like this. It's inspired me to buy games like Gravitron 2, which have a neon like quality. (I have two copies of Gravitron 2). I bought a copy after finding the freeware version (which can be found via G@rgoyles free games synopsis); I then bought a five or six pack deal via Steam which also contains a copy of Gravitron. It seems such a waste not to give one of them away. (If you want my original purchase Bill, let me know via Email and I'll send you the registration and download details. (It may take some time to find it though as I've been doing a lot of computer housekeeping over the past 3 or 4 months, so most of my games have been shuffled around, but I will find the details sometime. Giveaway of the Day Forums is proudly powered by bbPress.